I just wanted to do this post about the website Scarlett Hearts. They are an independent boutique, that sell jewellery and accessories which are handmade. I am officially in love! I have never seen such a friendly website that doesn't make me feel like I'm shopping from a generated robot. They definitely quench all your jewellery and accessory thirst. From vintage style necklaces to flower themed hair clips. They've got you covered ;) I got sent this necklace to me this morning and it's called "deer me". Isn't it adorable?! Bambi ♥ It's only £5.00 as well! That brings me to the other reason I am in love with this company. The price -there's little of it. The starting price for a necklace is a small amount of £3.00. Yep - you heard me! Lets just say, that it has made me one happy poor university student! Aw that is soooo cute! 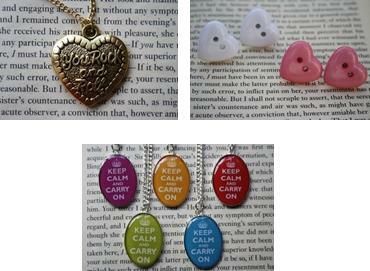 That is so cute and I love the keep calm and carry on ones. Awwwww so cute, i love finding cheap websites, eBay is my god. awww that keychain is too cute!! love those heart earings as well! !